Dr. Brian J. Miles, a urologic oncologist, shows off Invivo’s UroNav system at Houston Methodist. The system uses an MRI fusion technique to pinpoint areas for a biopsy. Bob Stearns knew prostate cancer might be in his future. His father had died of it in 1992, and several other relatives had succumbed to the illness. His urologist, Dr. Larry Lipschultz, monitored him carefully. In August 2007, when Stearns, a venture capitalist who lives in The Woodlands, was 57, Lipschultz found what seemed inevitable: cancer. 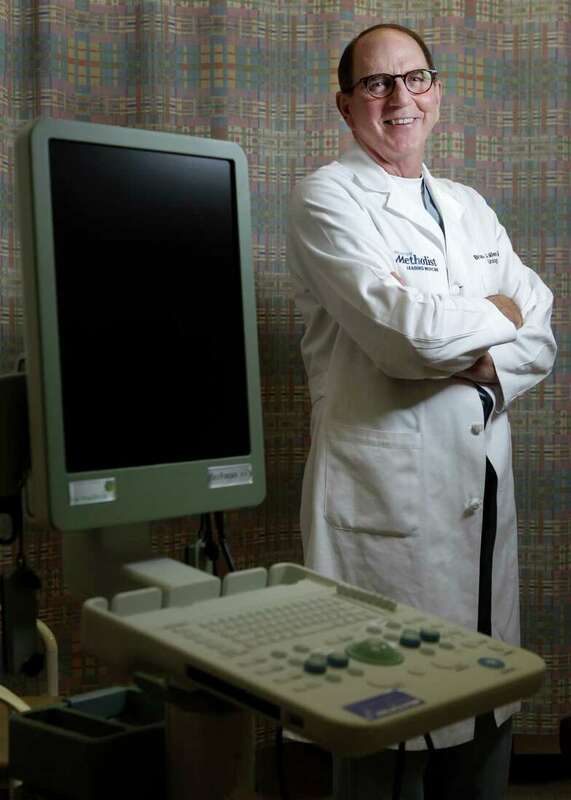 Stearns became ill before the latest innovations in prostate cancer screening were commonplace. Since his diagnosis, advances in technology have made the detection of prostate cancer easier and have handed doctors new tools to determine how to treat – or not treat – the disease. A technology called MRI fusion, only a few years old, which essentially marries a magnetic-resonance image with a transrectal ultrasound, gives physicians a 3D picture of the prostate gland and a much clearer idea of where cancer may lurk. Houston Methodist and M.D. Anderson Cancer Center are the only Houston institutions that use the technique. According to the American Cancer Society, about 30,000 American men will die of prostate cancer this year, and 233,000 new cases will be diagnosed. It is the second-leading cause of death by cancer for men, just after lung cancer. By and large, it is a disease of older men, with most cases diagnosed in men over 65. Some 2.5 million men diagnosed with prostate cancer are still alive. In fact, when Dr. Brian J. Miles refers to “younger men,” he means men in their 40s and 50s, a distinction that may be reserved only for prostate patients and presidential candidates. Miles, a urologic oncologist at Houston Methodist, is one of a handful of U.S. physicians who have done more than 1,000 traditional or “open” prostate surgeries and more than 1,000 robotic prostate surgeries. He sees MRI fusion as a useful advance over previous means of detection. Traditionally, indicators of prostate cancer have been a rise in the PSA score (a blood test to determine the level of prostate-specific antigen) and a digital rectal exam, in which the doctor probes for a hard spot on the prostate. The next step would be a needle biopsy of the walnut-sized gland, taking tiny samples from 12 quadrants. “It’s one needle and a big zone,” says Miles, and it was possible to miss cancers if the needle didn’t happen to hit them. The PSA score, he says, can’t tell how much cancer is present or how aggressive it is. The MRI fusion technique takes an existing MRI and layers it on a real-time ultrasound – another name for it is “multiparametric” – making it possible to pinpoint suspicious areas for biopsy – or decide not to biopsy at all. “You’re actually going to the spot that is at the highest risk for cancer,” says Miles. If the prostate is then removed, Miles will examine it to see if any cancer went undetected. Methodist uses a machine called UroNav, made by Invivo. It looks a bit like a standing computer desk. M.D. Anderson Cancer Center uses a similar system, called Artemis, which has a robotic arm. Methodist’s is in the clinic, whereas M.D. Anderson’s is in an operating room. The MRI fusion also makes it possible to decide which patient is a candidate for “watchful waiting,” which means hanging back and not operating immediately, waiting to see if the cancer will grow. In the past, Miles says, too many cancers, including many that would never threaten the patient’s health, were removed. “In a nutshell, we were perhaps overtreating the disease,” he says. Now between one quarter to one third of patients qualify for watchful waiting. “It’s not a question of should you find the cancer, but should you treat it?” he says. One advantage, says Ward, is that while MRI fusion is good at finding aggressive lesions, it’s not as good at finding the slow-growing kind. Ward stresses that making MRI fusion work “takes a whole team of people” including a radiologist who specializes in this technique and imaging specialists who can help get the image registration just right. None of this is without risk, says Miles. Even a simple transrectal biopsy carries a risk of infection. The surgery itself involves risk of nerve damage that can cause erectile dysfunction and, less seriously because it can often be fixed, loss of urinary control. You won’t hear these concerns from Bob Stearns. His urologist, Lipschultz, sent him to Miles, and he had his prostate removed in September 2007. “Happy doesn’t begin to describe what I am,” he says. The surgery was “very low-impact” with almost no discomfort. “I’ve had worse gum surgery,” Stearns says. He has no sign of cancer seven years later. He dodged the family curse. “If it’s done early enough and by the right person, you can walk away with all the functions that are important to you – and without cancer,” he says.